As many of my friends know, I'm looking after three cats for a friend. They had to relocate for a new job and I am minding the moggies while their owner looks for a suitable home with access to a garden. One of the cats is a crazy ginger kitten with boundless energy, whose photo I posted on A Bad Witch's Blog back in January. 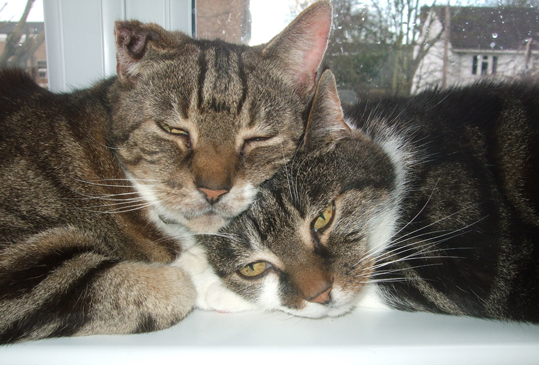 The other two are elderly cats who are very fond of each other and love to spend the morning dozing cheek-to-cheek in the windowsill. One of them has a mangled ear and looks like he has been in a fight some time in the past - but actually he is a big softy at heart. I've really enjoyed looking after all three cats but tomorrow they will be leaving me. My friend has now found somewhere to live where they can also keep pets. A witch does need a cat though, and my home will feel empty without them.